As a part of CSR activities, Managing Director of HeidelbergCement Bangladesh Ltd, Mr. Jean-Claude Jamar recently handed over a cheque to the A.K.M Mofizur Rahman,, the Executive Director of Community Development Library (CDL) to run their School Chetona Bikash Kendra (CBK) which is currently imparting education to 1200 slum dwelling children at Rayerbazar,Dhaka. During the Ceremony, group of high official from both organizations were also presents. 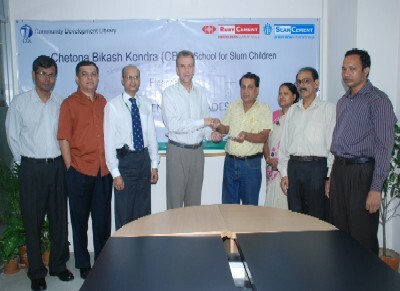 CDL, a non-government development organization, established Chetona Bikash Kendra (CBK) in 1986 for the development of slum dwelling people who never thought to view the light of education. Mr. Jean-Claude Jamar said that HeidelbergCement Bangladesh Limited is deeply committed to the people, society and country where it operates. HCBL feels that it is their social responsibility to stand beside the needy people of the society. He also hoped that this school would develop excellent future generation in developing prosperous Bangladesh.